I am taken aback by the “shock and awe” less than 50-square feet can inspire in someone. 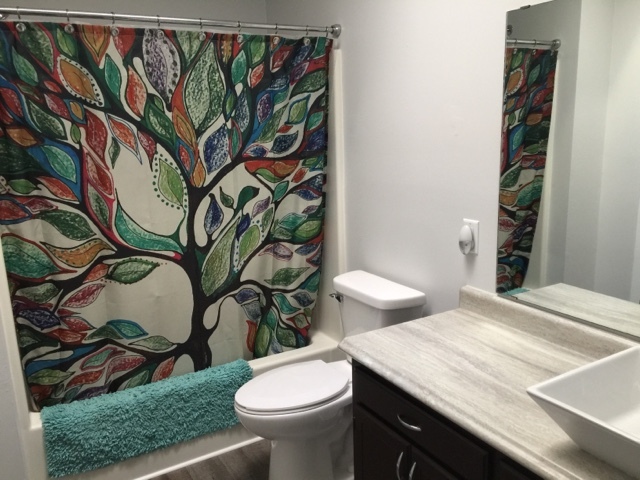 Unfortunately, I could not find a lot of the “before” photos I had taken of our upstairs bathroom. 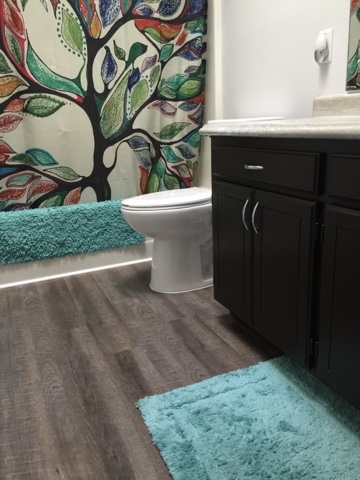 Before, the bathroom was completely functional and the layout was convenient. Somewhere in the home’s history, an additional doorway was added to allow access from the Master bedroom. Because it can be marketed as an “en suite,” Nick and I aimed to give this bathroom a serene, spa-like appeal. We did nothing to change the bathroom’s footprint. 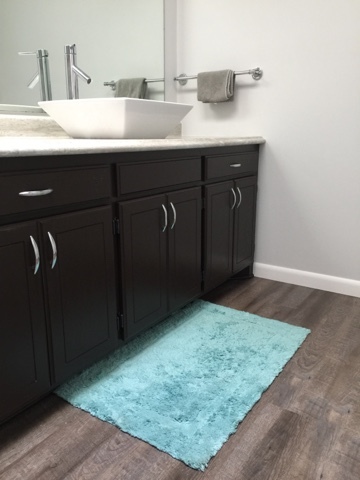 We utilized its strengths by keeping the original tub surround, large mirror and vanity. The vanity hardware and doorknobs were reused as well. The largest impact came from the new paint. We carried the same gray-and-white color scheme, and thanks to the skylight, natural light fills the room and reflects off the surfaces. During the day, we do not even have to turn on the light. 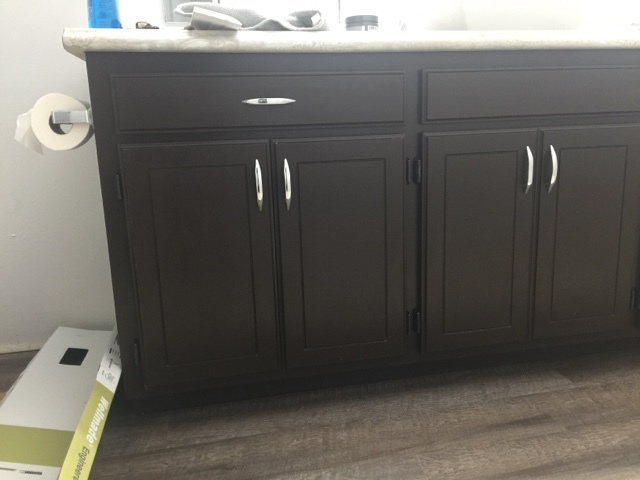 I refinished the vanity using a Rustoleum Furniture Kit (color is Espresso). But mostly, my main contribution to the renovation was chasing parts for my husband. Because this is a reflection of his skill, his patience and his handiwork. 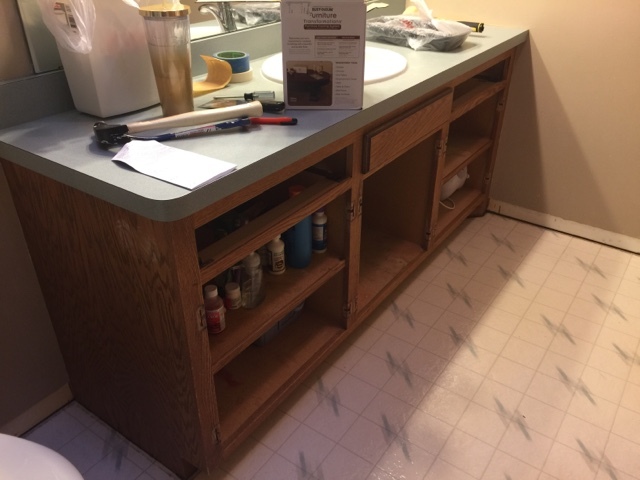 He laid the flooring, installed the new countertop, cut the holes for the new sink and faucet, added the new toilet and put up the baseboards and trim. 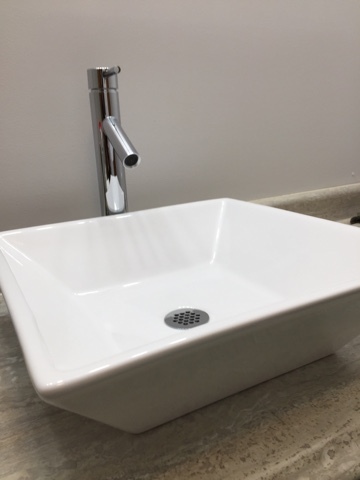 I cannot get over the impact the vessel sink and contemporary faucet has on this bathroom, which were his suggestion, and one I completely agreed with. 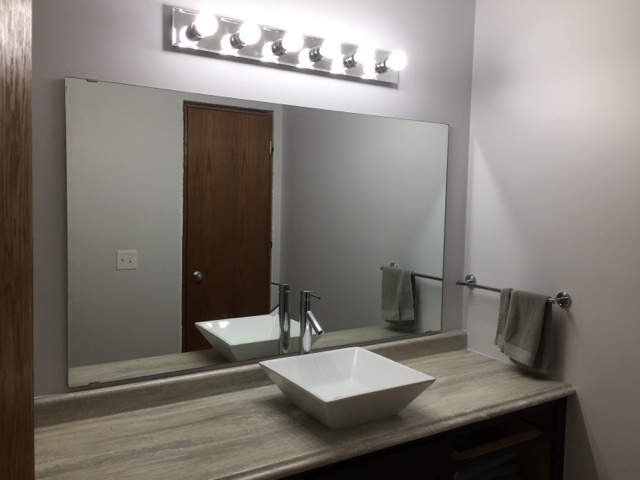 The sweat equity kept our renovation total to less than $1,000. The flooring purchase was our largest expense, but we bought enough to install it in our kitchen, stairs and basement landing. I don't think I could love it more.